Dull green top in cotton silk enhanced in patch and mirror work embroidery. https://www.kalkifashion.com/dull-green-top-in-cotton-silk-enhanced-in-patch-and-mirror-work-embroidery.html 12618 Dull green top in cotton silk enhanced in patch and mirror work embroidery. 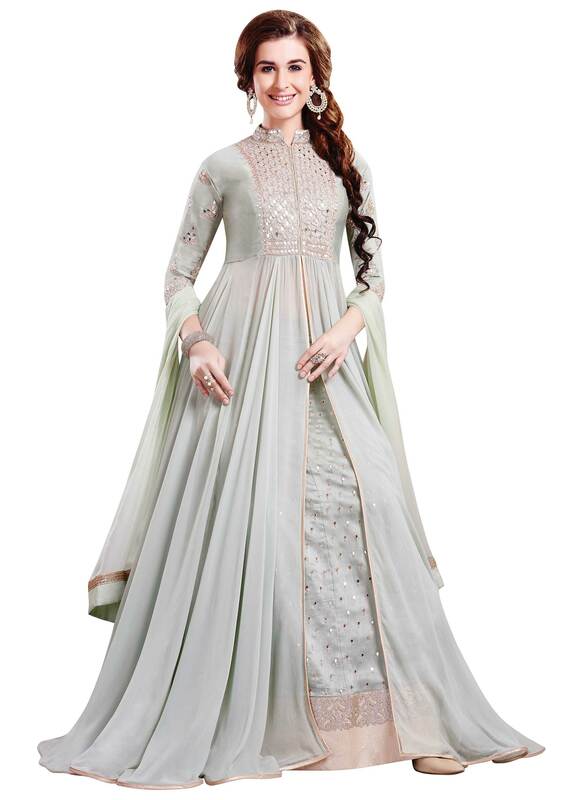 https://d8evit4zy2nlo.cloudfront.net/media/catalog/product/d/u/dull_green_anarkali_suit_in_cotton_silk_enhanced_in_patch_and_mirror_work_embroidery._-_410434_1__1.jpg 219 219.0000 USD OutOfStock /Lehenga Choli /Salwar Kameez /Salwar Kameez/Anarkali Suits /Salwar Kameez/Designer Salwar Kameez /Salwar Kameez/Festive Salwar Kameez /Lehenga Choli/Bridesmaid Lehengas /Lehenga Choli/Designer Lehengas /Lehenga Choli/Jacket Lehengas /Lehenga Choli/Mehendi Lehengas Dull green top in cotton silk enhanced in patch and mirror work embroidery. The dull green top is featured in cotton silk. The suit is embellished in patch and mirror work embroidery at the bodice. It has front slit and thin golden borders at its edges. The bottom fabric in cotton silk is a skirt with golden beautification.